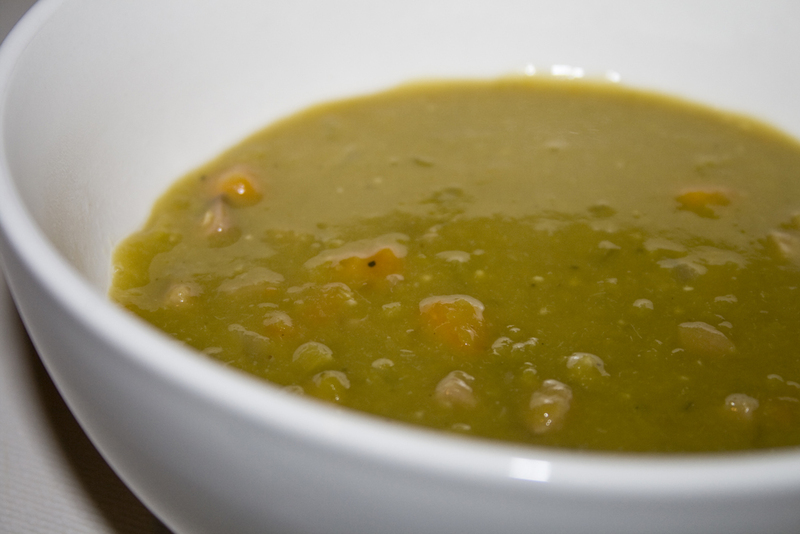 My mom has made split pea soup as long as I can remember. The giant pot simmering away on the stove would waft deliciousness all day. Is there a better smell than ham cooking? When I got a hankering for her amazing soup and called for her recipe, I got the bad news. There is no recipe. She just throws stuff in the pot. Darn! I hate when that happens. She did give me the general idea and I did the best I could to recreate some version of her soup. Here’s what I came up with. It was delicious. I actually started this in the crock pot today and then changed my mind and simmered it on the stove the way mom always did. I’m sure you could just as easily throw it all in a crock pot and walk away for 8 hours. Place the ham hock and ham in a large pot over high heat. Add the onion, celery, carrots, split peas (rinsed not soaked), garlic and ground black pepper. Add 2 cans broth and enough water to cover ingredients, bring to a boil, reduce heat to low and let simmer at least 2 hours or until peas have turned to green mush. Stir occasionally and add water or additional broth to adjust consistency to your liking. Stir together well and season to taste. I also grew up with my Mom’s Pea and ham soup. My mom’s recipe doesn’t include the carrots or garlic though – aren’t moms just the best!